I’ve been teaching in my discipline for a number of years and I’m curious about practices that might improve my teaching and the success of my students. I’d like to try a few new techniques in my class, but I’m unsure where to start, how big a change I should make initially, or whether the strategy I decide to implement will make a difference in student learning outcomes or their satisfaction with my course. One of the toughest moments in my teaching career was as a guest lecturer for a face-to-face course in the School of Interactive Arts and Technology at Simon Fraser University. Most of my teaching up to that point had been as an instructor for a series of fully online courses. Now I was being asked to do the reverse of my experience—the dreaded lecture hall experience in front of 200 students, all of whom came to class armed with a laptop, cellphone or tablet. I used Google to research teaching practices for bringing interactivity and engagement to large-scale lectures. 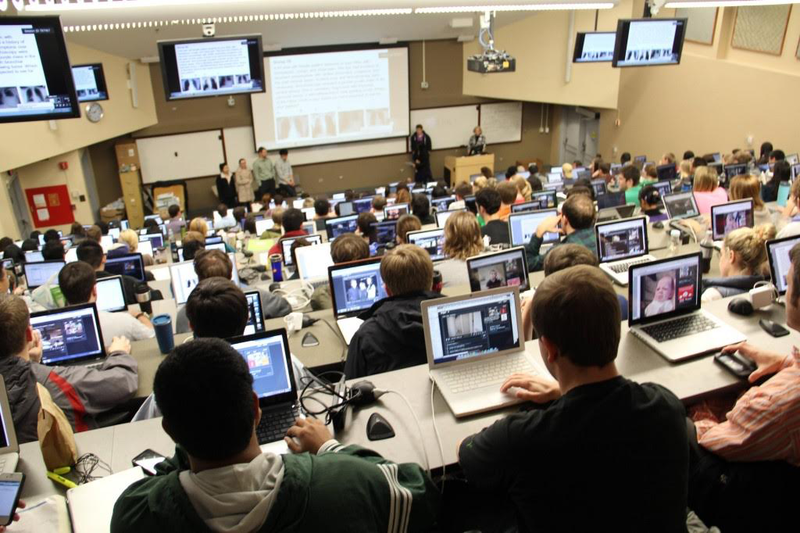 I researched how to employ the students’ own technology effectively in lecture halls to support learning engagement and lesson outcomes. The result was a one-hour lecture divided into three parts that involved the students individually, in pairs, and as a whole class, using a three interactive activities linked to the ideas associated with knowledge construction. I think it worked, but I went away wondering how I would handle the same group of students over an entire course and what framework I might use to research teaching strategies for large-scale lecture experiences in the future.